From the amazing Disney Infinity video game! Disney Pirates of the Caribbean's Davy Jones. Expand your Disney Infinity figure collection! The demon of the deep, Davy Jones is feared by all who sail the seas. Beware his sword-fighting feats and writhing tentacles! 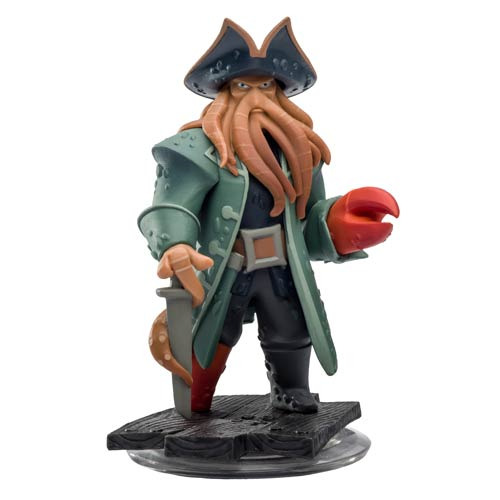 This Disney Infinity Pirates of the Caribbean Davy Jones Video Game Mini-Figure features the tentacle-bearded Captain as a playable character in Disney's amazing Disney Infinity open-ended video game world. Disney introduces Disney Infinity! A video game where a spark of imagination unlocks the freedom to play some of your favorite Disney and Disney Pixar worlds like never before. Play in their worlds! Place your Disney Infinity Figures onto the Disney Infinity Base to jump into a Disney Infinity Play Set and experience original adventures in the worlds of Monsters University, Pirates of the Caribbean, The Incredibles, Cars, and so much more. Use your Disney Infinity figures to battle enemies, solve puzzles, overcome obstacles and complete a variety of other unique quests! Ages 6 and up.